Drop a line to one of the editors anytime with your thoughts or suggestions - not necessarily long or deep - and encourage friends and neighbours to get involved. Make Eynsham News your own! Our publication dates are set out in the ‘Events’ section, so please note them for any event publicity. Do get in touch well beforehand if your story needs more space! Printed copies give the best 'feel' for our publication - you can generally pick one up in the Library or Post Office or Village Hall. Copy should be formatted as .doc or .docx or .txt - or simply pasted within an email. PDF files allow no flexibility in layout, so are appropriate for (paid) adverts only. Photos should be sent as separate files such as .jpg - not embedded in a document - and as large as available, please. We may need to edit contributions, to fit the space available. The free directory listings at Eynsham Online have no such limitations! 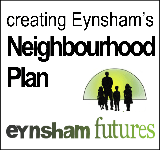 Eynsham News is an equal opportunity project, with hours as flexible as you like. We get paid in fun and we’d love you to join us - please give it a go. And if regular, long-term commitment is not for you, that’s not a problem: snaps and snippets, comments and corrections are very welcome too.